This remarkable vehicle is currently celebrating its 10th birthday having been registered in July 2006. 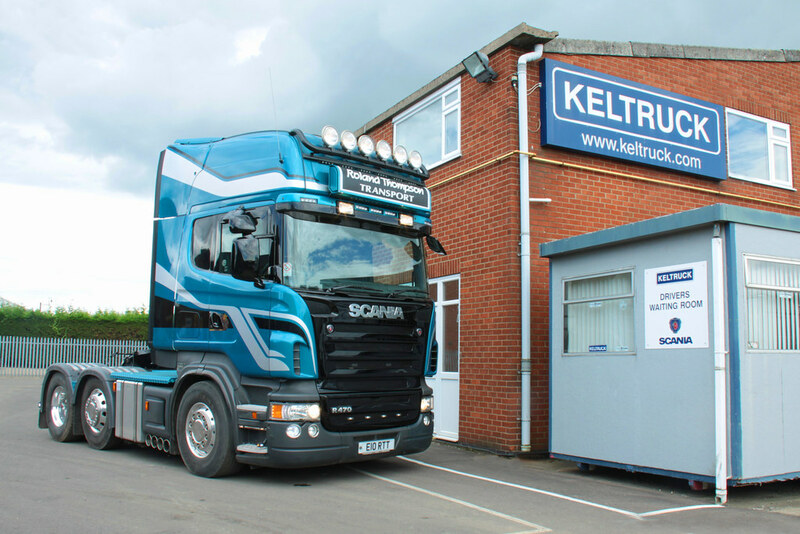 The vehicle was originally sold to present owner Roland Thompson by Keltruck in 2010 as a used vehicle. Roland has transformed this vehicle into how it looks today with the help of the Accident Repair Centre & paint facility at Keltruck Newark. 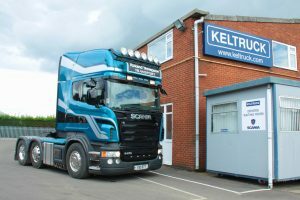 Phil Haywood, Depot Manager of Keltruck Newark talks us through how the vehicle became what it is today. “The vehicle originally started life as a Judds Transport vehicle based in Devon. Once in Roland’s hands the modifications started. “First of all was a roof mounted Kelsa top bar which was actually removed from his previous vehicle. The bar was blue and didn’t really match the vehicle but that didn’t stop Roland fitting it. “Not many customers would let you have free reign on their vehicle!”, comments Phil. Once Roland saw the finished vehicle he was genuinely over the moon. 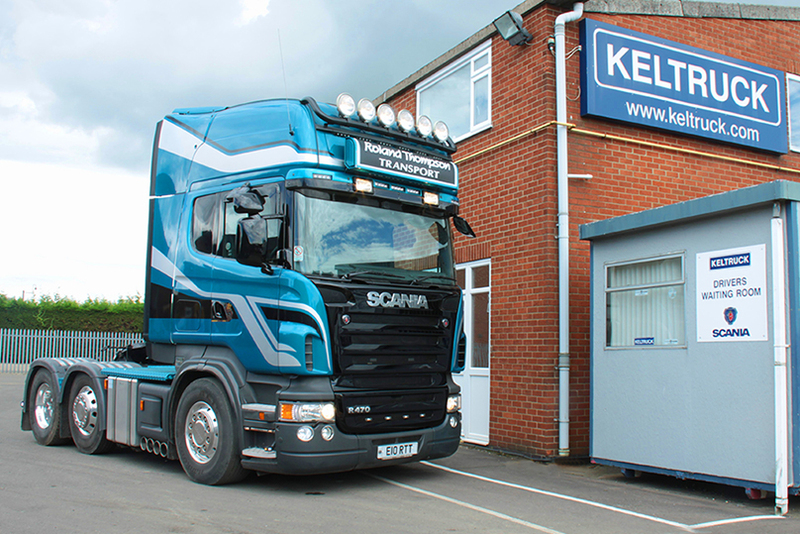 Keltruck had colour coded his upper light bar to match the satin black on his name board, replaced the original grey colour on the front grills with gloss black and removed the satin black contrast tape from around the windows and this was also painted gloss black. To finish off we colour coded the mirrors, door handles and even the wiper arm. Last of all was a good old machine polish. The Scania 470 horsepower, 12-litre six-cylinder Euro 3 engine in this vehicle was launched in 2001. The engine employed a new turbo and fuel technology. It was the first of the Scania engines at the time to be fitted with more modern high-pressure fuel injection system called Scania HPI which was developed and produced directly by Cummins following a project that was initiated in 1992. The engine featured a Scania in-house developed engine management system and ‘turbo-compounding’ which is an energy-recycling concept pioneered by Scania. The turbo-compound unit is essentially a second turbo that extracts residual energy from exhaust gas which is then recycled to the crankshaft thus boosting output and improving efficiency. Roland has been an ‘owner driver’ since 1984, initially working mainly in the UK until 1988 when he purchased a second hand Scania 112 for work to and from the continent. Loyal to the Scania brand, Roland upgraded to a 144 in 2002 and then to the R470 that he runs today. Roland now works locally and his eye catching vehicle can be seen running around the Newark area on a daily basis.